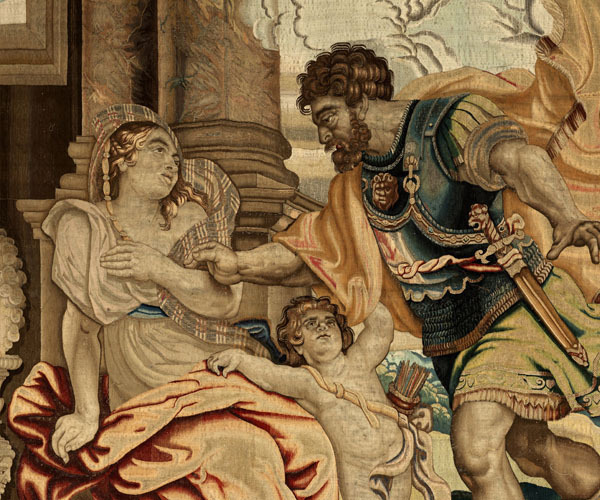 This series of eight tapestries tells the story of the Roman consul Decius Mus, who sacrificed himself in battle to give his army victory. It was weaved in Brussels in the 1620s using cartoons by Rubens. Rubens followed the story as told by Livy (History of Rome VIII, 6-9) and created an extraordinary series of cartoons, from which several tapestries were made. Two such series are kept in the National Heritage collections: Golden Decius (Series 52, so-called because it contains gold as well as silver), and Woollen Decius, in silk and wool (series 53). 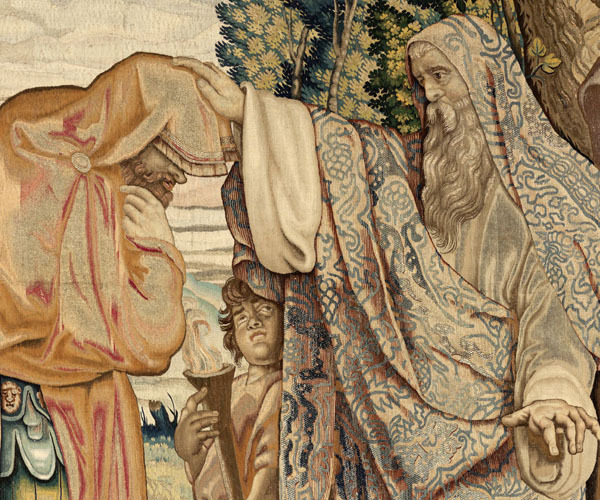 Two tapestries from the Golden Decius series are displayed in the Royal Palace of Madrid. Publius Decius Mus was raised to consular rank in 340 BC along with Titus Manlius Torquatus. Before they were to lead the army into battle near Vesuvius in the Second Latin War, both consuls had the same dream: one of them would have to sacrifice himself to gain victory. The oracle confirmed the truth of their vision and Decius Mus immediately offered himself to the gods, along with the enemy army. Victory was won for the Romans through the consul’s death. Rubens admired the story of Decius, whose sacrifice was worthy of a hero. 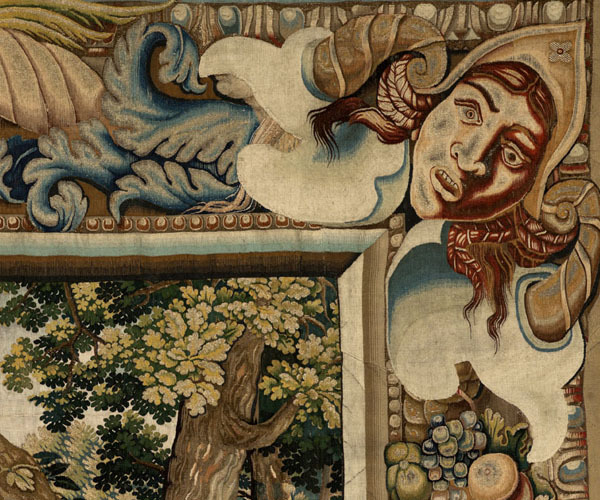 In 1616 he began a series of paintings recounting the feat as a base for a tapestry. We know that two series were commissioned by an anonymous Genoese client. Although there are no extant sketches, eight full-size cartoons are kept in the Liechtenstein Museum, Vienna, and five oil-on-wood modelli are kept in museums around the world. The cartoons are painted on canvas, breaking with the tradition of using watercolour on paper, which meant the cartoons had to be copied before being used in textile workshops. Rubens, who considered his designs exceptional, produces great drama by painting monumental figures and removing any anecdotic details. His sources of inspiration are Leonardo da Vinci’s The Battle of Anghiari and Raphael’s Acts of the Apostles. Pieces from the latter series are on display close to the History of the Consul Decius Mus series,in the Salón de Columnas of the Royal Palace of Madrid. The series kept in the National Heritage collections are documented in 1700 upon the death of Charles II. However, Philip IV had probably acquired them before for the Buen Retiro. The so-called Golden Decius series – the more valuable of the two – was weaved in the 1620s in Jan Raes II’s workshop in Brussels in collaboration with Jacob Geubels II. Their names and monograms can be seen on some of the tapestries. 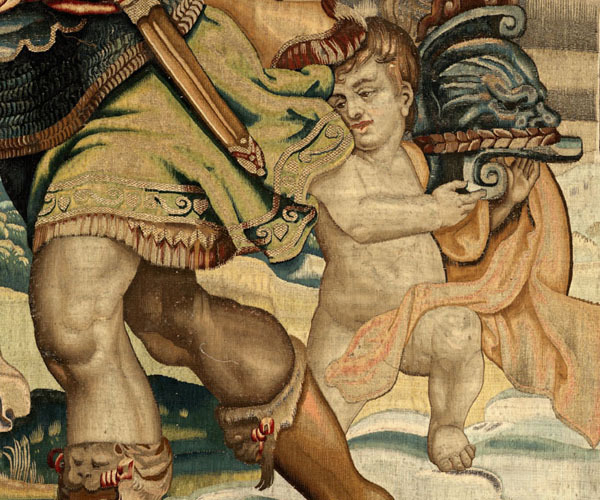 The eight valuable tapestries are a display of the weavers’ skill, successfully capturing the nuanced colours of Rubens’ cartoons. It is possible that Van Dyck assisted Rubens in the design of these cartoons. The stories are separated by wide borders with fruit, animals and geometric motifs which may have been designed by Rubens himself. J. S. Held, The oil sketches of Peter Paul Rubens, Princeton, 1980. P. Junquera de Vega and C. Díaz Gallegos, Catálogo de tapices del Patrimonio Nacional. Volumen II: Siglo XVII, Madrid, 1986, pp. 89-97. C. Herrero Carretero, “Decio Mus consulta el oráculo” and “La batalla de Veseris y la muerte de Decio Mus”, in Hilos de esplendor. Tapices del Barroco, Madrid, 2008, pp. 95-105.